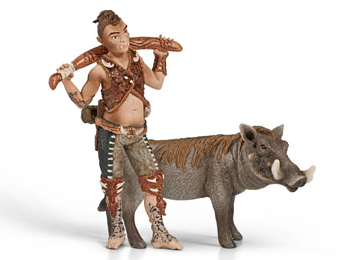 Schleich 70443 - Umitok, the warthog man, has no manners and is always misbehaving. Umitok is a good friend of Liassa and is also very popular with everybody in Bayala. His laid back pose is representative of his lazy side; he still has hold of his club though so he is ready when any enemies attack. The warthog is standing proud guarding his hero with his two strong tusks ready to be used as weapons in any fight.